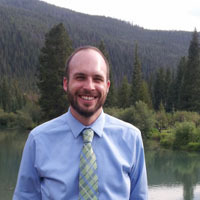 Peter Meyer graduated from UNM in 2008, having completed a Master of Arts in Latin American Studies. Peter chose to attend UNM in part because of the financial support provided by the program, but moreover because of the interdisciplinary nature of the Latin American Studies program and the wealth of Latin American resources available to UNM students. He notes, "My LAS degree helped prepare me for my current position by expanding my knowledge of the region, and enhancing my research and writing skills. My time at UNM also helped me qualify for the Presidential Management Fellows program, through which I was hired by CRS (Congressional Research Service)." Currently, Peter works for CRS, a legislative branch agency charged with conducting research and providing policy analysis to Congress. As an Analyst in Latin American Affairs, Peter tracks current events in Latin America and analyzes their potential implications for U.S. interests; assesses policy options for addressing U.S. concerns in the region; and provides briefings and written products to Members of Congress, congressional staff, and committees to assist them in their legislative and oversight responsibilities.